Intercom specialist RTS will be celebrating its 40th anniversary at this year’s IBC by introducing new products that reflect the latest shifts in broadcast technology. The KP-Series of key panels is based on the OMNEO open IP infrastructure developed by Bosch and uses Dante as the transmission protocol. RTS has in the last few years implemented OMNEO media networking on its intercom matrices, including the ADAM. This employs Open Control Architecture (OCA) to control and monitor the networks, with Audinate's Dante IP-based technology for carrying signals. This has now been extended to the key panel component of the communications chain by incorporating OMNEO into the KP-Series. This comprises three units: the two-rack KP5032, offering 16 function keys; the KP-4016 single-rack with 16 keys; and the EKP-4016, which is a one-rack extension unit also featuring 16 keys. All three are able to work with analogue matrices as well as systems based on OMNEO and Dante. Among the features offered by OMNEO are secure configuration and lower installation costs as it is based on widely available IT equipment. KP-Series panels offer full colour HD displays, with what is claimed to be higher contrasts, resolution and improved viewing angles. The units are able to accommodate Latin, Cyrillic and basic Chinese characters as well as English. There is also a four-way lever that allows one-handed operation of talk/talk and volume. 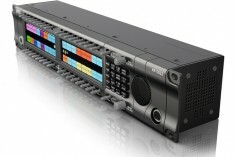 External interconnectivity is provided for GP-I/O and subsidiary audio tasks, which were optional on previous units. The integral loudspeaker is based on a design by the EV engineering R&D department. As part of its 40th celebrations RTS will be offering three iPads in a prize draw. To take part visitors only have to drop by the RTS stand in Hall 10, with a celebratory reception on the Friday of the show.